Urban regions across the country are seeing a trend of markets popping up during weekday meal times to feed hungry nine-to-fivers and busy families looking for wholesome food on the go. And farmers and suppliers are picking up on the trend by offering ready-to-eat foods, such as sandwiches, soups, pickles and popsicles. WASHINGTON – This Saturday, you can press the snooze button on your alarm. Because farmers markets are no longer just for early weekend mornings — and they no longer sell the expected. Urban regions across the country are seeing a trend of markets popping up during weekdays to feed hungry nine-to-fivers and busy families looking for wholesome food on the go. And farmers and suppliers are picking up on the trend by offering ready-to-eat foods, from sandwiches and soups, to pickles and popsicles. “Before it was just primary ingredients (at farmers markets). You know, fruits and vegetables,” says Ann Yonkers, founder and executive director of FreshFarm Markets, an organization of 10 farmers markets in the D.C. metropolitan region. On a Thursday afternoon at the FreshFarm Market by the White House, all 16 of the market’s regular farmers and producers sell some sort of prepared food offering. “It’s a national trend, as you know when you walk into your grocery store. There’s so much prepared food. And it’s also happening with local foods and sustainable foods,” says Yonkers, who attributes the growing trend seen at farmers markets to people’s desires for faster food and an increased supply of local and sustainable foods. Yonkers refers to the farmers market by the White House — which Michelle Obama opened in 2009 — as a market within a market. Market vendors, like Souper Girl, Chaya, Three Little Pigs and Pleasant Pops, get many of the ingredients for their prepared food offerings from the suppliers at the market. Chaya offers Mexican-inspired vegetarian fare. It’s one of the White House farmers market’s success stories. Eager eaters stand in a long line every week for a taste of the savory and seasonal dishes. “We source from the farmers markets here. And on Thursdays, we’re making tacos,” says Chaya co-founder Bettina Stern. Kinley Coulter of Coulter Farms has also adapted to the new trend of offering prepared foods at the market. He and his family bring meat from their Pennsylvania farm and cook and serve it throughout the market’s lunchtime hours. “This is farm to fork. This is an example of how the markets have changed and also the adaptation of the farmer to realize that they can actually take a product from the farm and carry it all the way to the table,” Yonkers says. Other popular prepared market offerings include the barbecue pulled pork on a jalapeno bun from Three Little Pigs and the deep-fried squash blossom po’ boy from Puddin’. “Squash blossoms are one of those things people don’t think about eating … but you can pick them, deep fry them, sauté them or stuff them with goat cheese,” Yonkers says. The brother-sister team at Number 1 Sons sells barrel-fermented foods, while the Pepe food trucksells Spanish-themed sandwiches from D.C.’s beloved chef Jose Andres. Baklava Couture uses local herbs and local honey to infuse filtered water, which is sold alongside homemade baklava. Using sage and mint is not just a seasonal ingredient for owner Katerina Georgallas. It’s how she shares her childhood and culture with others. “Growing up we always had a sage tea in the wintertime. Both sage and mint are very popular in Greece, so I thought it would be a nice compliment to the Baklava I bring to the market,” she says. Traditional produce stands, such as Spring Valley Farm & Orchard and Toigo Orchards, are not left out of the trend. They sell their jams, honeys, sauces and other homemade products. Cherries, cherries and more cherries. Yonkers explains that while we say goodbye to strawberries this month — and are still waiting for the tree fruits to come in — cherries are finally in season. Vegetables, such as spinach, kale, beets and other greens, are still in season. Garlic scapes and squash are also at the market this time of year and will stick around for a few months. “Squash is starting and squash will be will us all the way through October,” Yonkers says. For now, tomatoes are still available, but they are indoor tomatoes, not outdoor. Yonkers explains we probably won’t see outdoor tomatoes until mid-July. However, the indoor tomatoes at farmers markets are different than their counterparts sold in the store — they are picked ripe, not picked to be ripe. This gives them a lot more flavor, according to Yonkers. 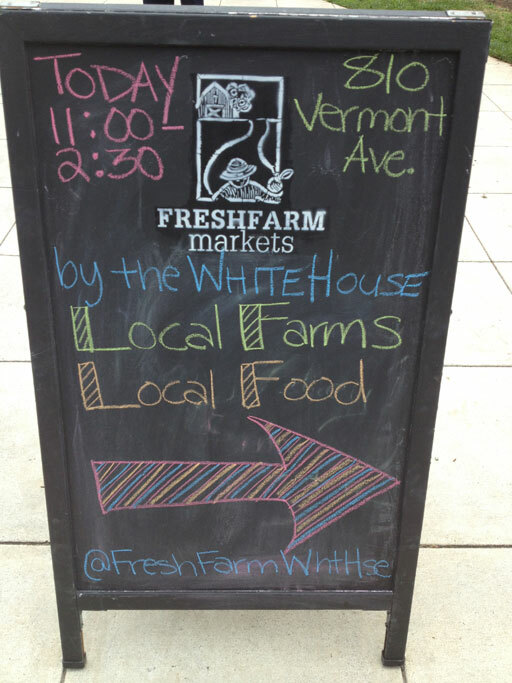 The FreshFarm Markets farmers market by the White House runs from 11 a.m. to 2:30 p.m. on Thursdays through Oct. 31.